Zealous Records have kindly given us a few copies of the new Soul Sides Volume 2: The Covers to give away at our album release party on Wed. May 30 at the Redline. Name the first track on my Sounds of Cellophane Vol. 2 Mix? Email the correct answer to: dj@deanosounds.com. 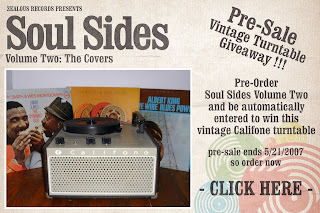 It's official Mood Mosaic is proudly sponsoring a listening party for the new Soul Sides Vol. 2 the Covers album coming out on May 22. The listening party date for us is May 30th so be sure to stop by. "Following up on the success of Soul Sides Vol. 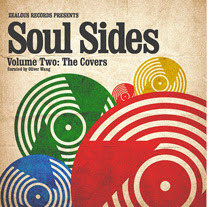 1, SSV2: The Covers is a tribute to cover songs - both soul remakes and remade soul. Compiled once again by Oliver Wang and presented by Zealous Records, SSV2: The covers includes 14 versions of songs you've heard before...just not like this, from Al Green's take on the Beatles' "I Want To Hold Your Hand," to Byron Lee and the Dragonaires giving Charles Wright's "Express Yourself" a remake to Antibalas Afrobeat Orchestra's makossa-flavored cover of Willie Colon's salsa classic, "Che Che Cole." If you liked SSV1, SSV2: The Covers gives you another dose of some of the best soul, funk and Latin you never heard." For more info and to pre-order your copying of the album go here. I must apologize for the delay in posting. But I've got a really nice treat to make up for it. I'm posting just a taste of what's to come. This is a mix Zeph and I did last week at Mood Mosaic. It features tracks from Prince Buster, Mucho Plus, Xingu, Gil Scott-Heron, Curtis Lundy, Manny Corehado, and Eliana Pittman. This is just the first part of the mix. We recorded over 3 and a half hours of music. But to check out the rest of it you're going to have to subscribe to our podcast which is still in the works. We'll let you know when it becomes available.